It all began with a short ride through a sultry Tennessee woodland, close to home. And it ended about four years later, sitting on a bench in the North Carolina mountains, after an exhilarating day climbing granite peaks and roaring down hill past fern-enshrouded waterfalls. Between those bookends were the coming of age of a son, the education of a father, and some of the best times of my life. Shortly after his 13th birthday, Alex earned the money to buy his first mountain bike. At the time, I owned a folding bike with skinny tires. I had announced it would be my “last bike,” since I rarely rode anymore. On our first trail ride, it sank axle-deep in a puddle. “Here Dad, try this,” said my son, thrusting his new bike at me. So I took a quick spin out to the edge of the plateau. I still remember the feeling: banking confidently into the first turn, gathering speed on the fat tires, the leaves around me morphing into a green blur. After a few minutes, I turned and headed back. But I was hooked. I bought my entry-level mountain bike shortly after. My son would need a riding companion in those early teen years, I rationalized. My first true mountain bike ride came a few weeks later at Harrison Bay State Park. There were no mountains in sight, but the park offered a rolling 4-mile loop around the lakeshore. We showed up with our new bikes for an after-work ride with the local off-road club. I had been out with serious road-riding friends in college once or twice, so I had some sense of how fast these guys might go. I knew it could get ugly. But I’d forgotten how bad it was going to be. For the first mile of the loop, I felt pretty good. I still had the last rider in sight, and I hadn’t fallen off my bike. “Hey this isn’t too bad.” Problem was, I was going full out, and they were just warming up. I started breathing hard. By the halfway point of the loop, I was seeing double and too exhausted to reach down for my water bottle, which I desperately needed to clear my throat, threatening to close off in the Tennessee August air. At the 3-mile mark I was on life support, spent legs pumping in random desperation. The little man in the back of my head, started a running commentary: “Is he going to puke, black out, or crash first?” Tim, the sweep rider coasting on my tail, urged me on with diplomatic goodwill: “You’re picking a great line,” he said encouragingly. Soon a couple of rescue riders from the main group showed up. They’d come back to see if there was a problem. There was: I needed new lungs. As I limped over the finish line, the rest of the group was preparing to launch into lap number two. Somebody politely asked if I was ready for more. “No thanks,” I choked out as I coasted into the parking lot to resuscitate. It was 15 minutes before my breathing returned to normal. Despite the near-death experience, later that night I felt pretty good: light and healthy. The next day, I wasn’t even sore. A curious thought came: “I may have to try this again.” Anyway, Alex would need a driver for his coming adventures, so I didn’t have a choice…. So began the mountain biking years. Most weekends, and several afternoons a week, found us heading out for rides on our trusty two-wheeled steeds. We upgraded our entry-level bikes, first the components, then the frames. Eventually we were both riding near-race-quality machines with beautiful, precision-engineered aluminum, titanium, and carbon fiber parts. Soon enough, each was scratched and dented from outdoor abuse. But we kept our bikes clean, tuned, and lubed, and they never failed to carry us home. In the fall, after the time changed, we bought powerful rechargeable headlights and rode in the nearby state forest at night, as long as snow stayed off the ground. My wife frowned on the nocturnal rides, but we loved the adventure. The pulse of our mountain biking years was the regular visits to Tanasi/Chilhowee in the Cherokee National Forest of southeastern Tennessee. The Ocoee River running through its heart was the site of the whitewater events for the 1996 Olympic Games. It’s a lush area of verdant ridges and rocky, rooty trails. We rode there 100 times or more, over the years. It was home base. Our first visit was in the fall of 2004. We were on a weekend vacation in the mountains with Alex and a friend. We’d been tipped off by some riders in North Carolina that Thunder Rock Express was the trail to do for “real downhill.” At the start of the steep section I wished the boys well, admonishing them in a fatherly way to be careful. The ensuing ride terrified and delighted us all with its banked turns and fast descents, culminating in a 90-degree turn at speed on a rock shelf before a drop-off. Then came the final tortuous descent to the power station by the river. We rode in all weather, in all seasons. I remember those first beautiful fall colors, many a crisp winter ride in barren woods, the green flush of spring, but mostly the hot, humid summers. We rode uphill for hours in 90-degree temperatures and 90% humidity, mosquitos buzzing, only the breeze from our tepid pace to cool us. Gradually my middle-age physique transformed to handle the challenge. It was purification by fire. The ultimate test in the area was the Clemmer/Clear Creek loop, featuring a relentless two-mile climb uphill on old fire road, not more than a few yards of level terrain the whole way. To “clean” Clemmer (ride it to the top without stopping or touching down), was a final exam of sorts, an entrance into the community of competent mountain bikers. I finally accomplished the feat in early November of 2005. All the way from the trailhead to the bridge at 2.3 miles, including the difficult rocky sections at the top of the climb, in a continuous push. It was a beautiful warm fall day, clouds and sun, colors at their peak. Alex arrived well ahead of me, as usual, and waited. Gradually, we had conditioned ourselves for bigger adventures. 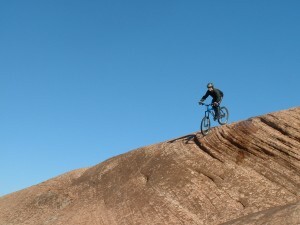 February of 2005 found us planning our first trip to Moab, Utah — the mountain biking mecca, famous for “epic” trails. We needed to ride longer distances. So we headed to Dupont State Forest in North Carolina for a weekend of bigger challenges. On the way, we stopped for an afternoon ride in jewel-like Panthertown Valley. The ground was frosty, even in the bright sunshine, and we caught chills stopping to change a flat near a shimmering stream. It was dusk when we finally arrived at Dupont, and stopped to scout one of the trailheads we might use the next day. It was just us and the stark winter woods as the sun glowed dim orange in the west. Then a large troop-transporting helicopter roared over a nearby ridge and stabilized overhead. It discharged a small group of men into a nearby field. What was the mission? We never learned…. The next day we enjoyed a leisurely breakfast, allowing the air to warm. Then we set out on our circumnavigation of the forest, starting from a parking lot on the southwestern edge. 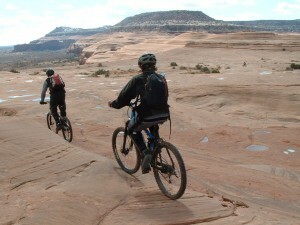 The ride would be more than 23 miles of trail and dirt roads, comparable to what we anticipated on the classic rides in Moab. The route was well marked and well maintained. We had about 8 hours until sunset. We were in shape and riding strongly. What could stop us? The first half of the day went smoothly. In the early afternoon we passed the trailhead where we’d seen the chopper the night before. We rode another mile downhill. And stopped in our tracks. A fast-flowing stream of clear cold mountain water barred our way. It wasn’t too wide, maybe 10 feet, but this was February, and it was waist deep in places. Unwilling to contemplate turning back, we slipped off our shoes, hoisted bikes, and plunged across. It was painful, but quick. The cold was soon forgotten as we climbed several miles to the high point of the day. From there we coasted downhill as the shadows grew long. The day was fading, but we only had a few miles to the parking area where we had left the car in the distant morning. Then we hit the second water crossing. This was a small river. Shallower than the first, but much wider, 30-40 feet. Long enough that our bare feet and ankles were in agony from the frosty water by the time we reached the other side. We hurriedly threw on shoes and socks and launched off to climb the final ridge, chilled to the bone. The sun was setting. With less than two miles to go, we coasted down the far side of the ridge through sparse woods in the darkening day. A mile to go, the woods slumped into darkness. Then we reached the most serious obstacle of the day: Another river crossing. This one was about 30 feet across, a little faster and a little deeper than the last. And the water was running over mossy, icy rock. It was February, virtually dark. The temperature was headed below freezing. There was no turning back. We ripped off shoes and socks and hoisted bikes for the last time that day, making one of the most painful water crossings of my life — tense agony torn between desire to cross the ice bath and needing to step gingerly on the slimy, sharp river rocks. We reached the other side, at last. Cold as it was, I remember only the warm glow of success as we sprinted that last mile to the car, and dinner, and our room in town. When morning dawned, I knew we were ready for Moab. From my vantage point, flat on my back, there was nothing but sky — that burning turquoise blue, unique to the southwestern desert. It stretched from one horizon to the other, marked only by a few of Moab’s reddish-brown cliffs on the periphery. The scene was idyllic but for the pending headache, the gash in my calf, and the gunning of jeep engines behind me. The jeepers’ initial amusement was wearing off. They’d had a good laugh watching the 44-year old guy attempting to keep up with his talented young son. The old guy took a turn too sharply, dug his front wheel into the Moab sand, and launched head first over the handlebars. That would be me, on my back now. I unclipped from the tangled mass of cycling machinery between my legs, struggled to my feet, and managed a weak smile: “No problem, I do this all the time.” I wobbled 20 feet to the next obstacle, White Knuckle Hill, a terrifying cliff that Alex wisely walked, after some consideration. I did the same, with considerably less debate. It was another awesome day in Moab. We were on the epic Behind the Rocks trail, traversing a beautiful and diverse section of the region’s most challenging terrain. The ride starts south of town in a sandy campground, launching out across a network of jeep roads into a broad valley. Eventually it drops into a labyrinthine drainage that deposits you in another spectacular valley, which you climb to a breath-taking pass. We reached the pass late in the afternoon. Nothing could have prepared us for the view ahead. There were at least 100 jeeps, bumper to bumper, stretched down the next canyon, as far as they eye could see. They were attempting to crawl up the same rough track we would be biking down, but were slowed to a stop, winching recalcitrant vehicles over major obstacles. It would be dark and cold in an hour or two, but they were unable to turn around or back out of the tight canyon. Some parties had been sitting still for 5 hours, and had little more in the way of outdoor gear than flip-flops and coolers. Riding carefully, we threaded our bikes through the jeeps and around the obstacles, making relatively quick progress down the canyon. At one point we passed a jeeper running back to his vehicle with a new axle. We met our ride back to town at the trailhead just as it was getting dark and starting to rain. Later that night, we saw rescue trucks heading out of town. Next came Porcupine Rim. Some call it the greatest mountain bike ride in the world. It begins at around 6,000 feet, climbs to near 7,000 at the aptly-named High Anxiety Viewpoint, then descends nearly 3,000 feet, over many miles, to the Colorado River. Much of the way features spectacular views of Castle Valley to the east, the La Sal mountains to the south, and Arches National Park to the north. The riding varies from moderate to difficult to highly technical. Smoothly flowing singletrack is preceded by miles of babyhead-sized rocks. I’ve never been so beat up by a ride, yet I’d do it again in a heartbeat. 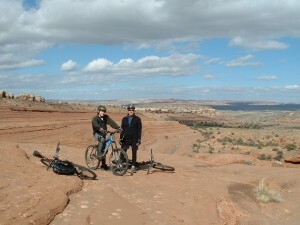 Our first two years in Moab we hired guides. Alex wanted to push the limits and I wanted a third hand on deck, one who knew the territory. Of the guides, Aaron was the standout. He was cool, mature, and an incredible rider. He and Alex connected immediately. They passed many contented hours together on Moab freeride terrain — SlickRock Trail, Bartlett Wash, Amasa Back — riding sandstone bowls horizontally, launching off high drops and landing gracefully, me a shadow in the background. Every year in Moab we roomed at the venerable but fraying Apache Motel, “Where John Wayne stayed.” The proprietor, a grand old western dame, was part of the attraction. But you’d better keep on her good side. No trouble and no complaining. Her signs warned, “Do not use towels on jeeps or bikes, as it may stain them permanently.” One year, during a hot spell, we complained about the 90-degree temperatures in the room, and were informed that March was too early for air conditioning. A trip to Moab would not be complete without a final night’s celebratory dinner at the Desert Bistro, the best restaurant in town. It was located in an historic and intimate Victorian ranch house, run by a gracious and talented couple that loved Moab as much as we did. The food was never less than superb, even factoring in the ambiance of Moab. Our golden era of mountain biking adventures ended, unbeknownst to either of us at the time, in July 2008 in Pisgah, North Carolina. It was a short trip, barely 48 hours, but was the highlight of my summer. That was the year I declined to plan a long family vacation out west because I was close to retirement and watching expenses. We would do a big vacation “next year.” But next year never came. The Great Recession started and the stock market fell. Alex graduated high school and left for college. There was no longer time or interest in family vacations. But that July we drove up to Pisgah on a Friday afternoon, pulling into the sweltering Kitsuma parking lot east of Asheville late in the day. We unloaded bikes and launched up the trail. We climbed steeply up switchbacks to a knob, then descended for miles to a small picnic area in a cool, green hollow. From there the ride led back up an abandoned highway near an old railroad line, to the parking lot. The mountainside was gradually being claimed by kudzu and, in places, the rapacious weed covered the pavement entirely, forcing us to pick a line through a shifting sea of green. Saturday morning we started early. We drove fire roads out to a gap below Laurel Mountain. The national forest was thick here. We mounted our bikes and climbed lazy contours up the mountain through big trees that reminded us of the Ewok forest in Star Wars. After a few hours, soaked in sweat, we reached a lush gap high on the mountain. I lingered and rested, while Alex climbed a bit higher. Icarus, he descended safely back to me this time. We headed down, coasting most of the way, Alex far ahead of me. Near the end, I made a pit stop. As I was remounting my bike, he appeared, coming back up the trail. He had been concerned about me. It was late afternoon. We had always finished strong. We decided to squeeze in another ride: Pilot Cove/Slate Rock Creek. It was 5:00 pm by the time we reached the trailhead further into the forest, unloaded our bikes, and set out. The ride began as a brutal push up a knob in scraggly woods. This didn’t seem worth the effort. The shadows were growing long. Should we turn back? Eventually we reached the top, walked out to an exposed granite dome on the back side of the knob, and rested from our uphill labors. The air was tinged with humidity. The sun was in a low haze. 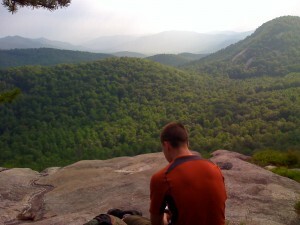 The views south into Pisgah were among most beautiful in the East. The scene spoke of fruition, my past adventures in these mountains, and the passing of the torch to the next generation, my son, now a young man. We coasted down steep terrain to the gap behind the knob. It was then that the day became immortal. For several spectacular miles we descended past waterfalls, fern valleys, and deep streams. The raw beauty took us by surprise. For reasons beyond my ken, on that day this modest hollow in North Carolina held marvels to rival the epic rides of the West. Would it ever end? At last we reached the fire road. A tough climb up gravel drenched us in a new layer of sweat and brought us back to our car. The last mile was tough. I told my son he had “put the hurt on me.” But I kept the pace. It would be the last time. We changed clothes, loaded bikes, and drove south out of the Pisgah backcountry listening to Leo Kottke on CD. They were the same songs I’d listened to on cassette when I was here as a teenager on rock climbing weekends in the late ’70s. We stopped at famous Sliding Rock for Alex to cool off in the water chute and natural mountain pool. We were alone there in the damp and dusk. My son living the last days of his childhood. We had dinner at our favorite Mexican place just outside of Brevard, then went across the street for ice cream. We sat on a rustic wooden bench, exhausted and content. The advancing dusk separated us from the crowd of summer tourists queuing at the ice cream stand. “Life is good,” I said. And it was. On Sunday morning we packed, grabbed breakfast, then headed out to Bent Creek for a last ride before driving home. We found our way to one of the newly constructed parking/rest areas and I circumnavigated, looking for a spot. A large black dog streaked past us and into the bed of a nearby pickup truck that held a big freeride bike. After parking, I attended to pre-ride chores. When I next looked up, Alex was at the truck chatting with the young guy who rode the big bike, and petting his energetic dog. Bits of their conversation wafted over to me on the sultry breeze. Where were we from? “Chattanooga.” Done much riding? “Yup. Been to Moab four times for spring break.” Wow, your Dad must be nice. “Yeah, he’s pretty cool,” came the monotone reply. It was one of the few compliments I received in those years. It would suffice. It was the last day of our trip, but it was really a postscript to the previous days, and years. My legs were weary, a feeling I had noticed more and more often of late. It was all I could do to make it up the first set of hills. The steep, bare clay trails were tough climbing. Eventually we reached a sculpted downhill run, dirt worn smooth by hundreds of riders. Alex, psyched, was surprised to see me out of gas. He hike-a-biked up for the fast descent, while I sat on a rock at the bottom. The woods were thick with humidity. My legs throbbed. Mosquitoes buzzed and bit. And I was at peace. Some years later, Alex gone at college, I was on my way back from visiting family in the north Georgia mountains. I stopped off in Tanasi for a familiar ride. It was a trail I had done with my son a dozen times. Now I was alone. I set out from the parking lot across the familiar bridge and began the arduous climb along Bear Paw Loop and up Chestnut Mountain. The woods were just the same as they used to be. And they were different.